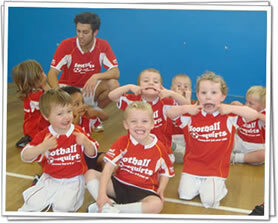 Football Squirts delivers fun-filled football classes for children between the ages of 2 – 7 years old. It’s all about putting a huge smile on their faces whilst enhancing a child’s self-esteem, self-confidence and developing both fine and gross motor skills. We believe that encouraging sports at an early age promotes a healthy life for your child – and this is our passion, this is why Football Squirts exists today! It’s all about fun, fun and more fun! We introduce the very basics of football such as, stopping the ball, movement with the ball, changing direction, boundaries, sharing space and working as a team. 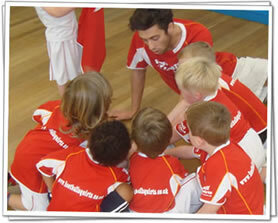 Our unique and creative games will use the children’s imagination and creativity. The coaches also aim develop children’s basic literacy and numeracy, whether it be mark making or simple addition during one of our fun activities. At the end of each session the football squirts will have an opportunity to score lots of goals past the coaches and then celebrate in front of the delighted parents. The children will have the opportunity to experience real football and participate in mini tournaments throughout the programme.